The filmmakers behind Disney's "The Nutcracker and the Fourth Realm" relished the idea of reinventing a time-honored story. Based on E.T.A. Hoffmann's classic tale and "The Nutcracker," "The Nutcracker and the Four Realms" showcases the wondrous journey of Clara, who finds herself in the mystical world of the Four Realms, home to a host of eccentric characters and no shortage of surprises. 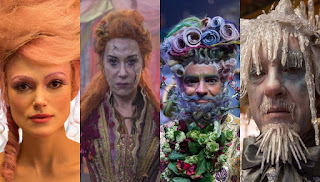 Foremost of these characters are the Regents of the Four Realms -- the Sugar Plum Fairy, Mother Ginger, Hawthorne and Shiver. Let's get to know them better! SUGAR PLUM FAIRY is the beloved regent of the Land of Sweets, the yummiest of the realms with its gingerbread architecture and gum drop décor. Elegant, ethereal and naturally sweet, Sugar Plum wears a gown that sparkles like crystalized sugar. She welcomes Clara to the Four Realms with open arms, declaring her the guest of honor at an extravagant pageant. Clara's mother, Marie, was once Sugar Plum's dearest friend, so Clara is family. "Sugar Plum is the personification of femininity," says Keira Knightley, who portrays the character. "I like to do a lot of research, so I started with the actual music of the Sugar Plum Fairy, which led to her laugh. I later found her high-pitched, girly voice that has two sides to it: pristine femininity and at the same time, quite assertive." MOTHER GINGER, leader of the dark and ominous Fourth Realm, is feared by all who inhabit the other realms. She once presided over the beloved Land of Amusements, a place of wisdom and entertainment, but a fierce dispute among the regents led to her banishment and her realm became a forgotten fairground with an abandoned carousel and wayward polichinelles. Mother Ginger sports fiery red hair and a face that's chipped and cracked like a broken doll, a look that surely underscores her reputation as an evil tyrant. Helen Mirren fills Mother Ginger's shoes. "She is a very wise character - she has great insight," says Hallström. "Helen Mirren has the authority and intelligence to play a character like that. She's so smart and she's funny." HAWTHORNE is the emotional and flamboyant regent of Land of Flowers, a fragrant and colorful realm with windmills, emerald foliage and blooms abound. Always smiling and filled with enthusiasm, Hawthorne heartily embraces celebration and pageantry. But he tends to shy away from conflict and often finds himself overshadowed by his fellow regents. He worries about the instability that threatens the realms - though he's quick to set his concerns aside when Clara arrives. In fact, Hawthorne is the first to react - bursting with unbridled excitement, much to the chagrin of the more reserved Shiver and Sugar Plum. According to Eugenio Derbez, who plays Hawthorne, the look of the character leaves no mystery as to which realm he oversees. "I'm like a walking bouquet," says Derbez. "I'm covered in flowers! It took two hours in the makeup chair each day to complete the look because they had to strategically place a lot of small detailed flowers on my face. SHIVER is the regent of Land of Snowflakes, a stunning winter wonderland with ice castles and alpine villages set against a white-peaked mountain backdrop. Shiver is a well-mannered gentleman who's concerned with the future of the realms and nervous to a fault, Shiver wrings his hands with angst and uncertainty. He might come off as serious and unengaging - some would say cold - but Shiver is quite friendly underneath all of that frost. Richard E. Grant was called on to portray Shiver. "I have snowflakes all over my face," says Grant. "My beard is made of icicles, I have a 19th-century wig with icicles coming out of my head, and my fingernails are very long icicles, too. 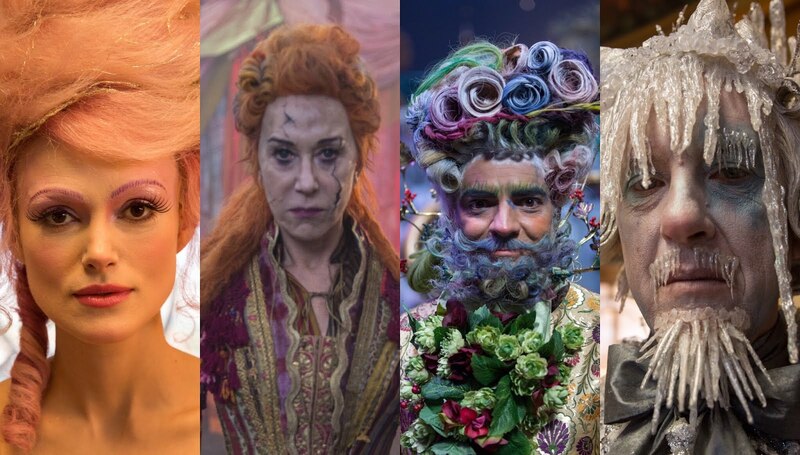 Jenny Beavan's extraordinary costume design, combined with Jenny Shircore's brilliant icicle make-up and wig design, instantly conjured up a severe looking, Arctic regent, obsessed with preserving his snowy realm from being changed or destroyed by evil forces. Shiver is willing to risk everything to support and protect Clara." "The Nutcracker and the Four Realms" is now playing in Philippine cinemas nationwide. About "The Nutcracker and the Four Realms"
All Clara (Mackenzie Foy) wants is a key – a one-of-a-kind key that will unlock a box that holds a priceless gift. A golden thread, presented to her at godfather Drosselmeyer's (Morgan Freeman) annual holiday party, leads her to the coveted key - which promptly disappears into a strange and mysterious parallel world. It's there that Clara encounters a soldier named Phillip (Jayden Fowora-Knight), a gang of mice and the regents who preside over three Realms: Land of Snowflakes, Land of Flowers and Land of Sweets. Clara and Phillip must brave the ominous Fourth Realm, home to the tyrant Mother Ginger (Helen Mirren), to retrieve Clara's key and hopefully return harmony to the unstable world. Starring Keira Knightley as the Sugar Plum Fairy, Disney's new holiday feature film "The Nutcracker and the Four Realms" is directed by Lasse Hallström and Joe Johnston, and inspired by E.T.A. Hoffmann's classic tale.